Cover Story: Advertising- How is that Working for You? After moderate growth in 2017, furniture surged forward last year, achieving a 3.5% growth in Q3/2018 over the previous year. Quarter four appears to be a similar result. This growth, while positive for the industry, indicated performance was outstanding when compared to other retail sectors. Achieving the status of outstanding growth has caused the financial community to focus on what is happening in home furnishings. This has brought attention to the potential investment opportunities in the industry. While much attention has been focused on the e-commerce sector of the industry, this juggernaut is slowing, achieving only a 13.1% growth in 2018. This growth has been in total home furnishing and initially improved the performance of home furnishing stores (those that merchandise the total product) as compared to furniture stores that primarily sell furniture and bedding (70% by definition). However, this comparison has changed with furniture stores regaining the momentum. 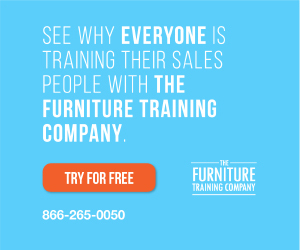 But with all this clamoring, many furniture retailers are facing declining traffic and the resulting sales decline. The result is owners challenging their advertising strategy. Let’s focus on what is the right advertising strategy. By definition, advertising is the attempt to influence the behavior of customers with a persuasive selling message about the product. First, we must have receptive consumers. Based upon research, the industry has that. As is typical in a good economy, a quarter (29.74%) of the prime furniture purchases are on the sideline. Another 15% have just made a purchase. The remaining fifty percent plus are our targets. Furniture is on the fringe of satisfying a basic human need. Home furnishings is not a necessity in terms of basic needs, but instead provides comfort and for some consumers, a sense of presence. Insight form FurnitureCore, the research arm of Home Furnishings Business provided some perspective. From the research, we see that our advertising effort must be a dual focus, communicating prestige as well as practical need. Considering the current advertising effort by the traditional retailers, we skipped these messages and are addressing price and the ability to finance. In fairness to the industry, the manufacturer sector is typically involved in communicating prestige/need in the process of establishing brand. In today’s residential furniture arena there is a lack of established brands. The Broyhill, Thomasville, and Lane brands have been allowed to deteriorate. With consumers under 50 (Generation X) and definitely under 35 (Millennials), there is little brand awareness. There are some exceptions with Brown Jordan, Eckornes, and Stickley who have presence with the more affluent consumer. Why are brands missing from today’s communication with the consumer? First and most immediate, there is little brand advertising. As an example, in the most recent issue of Southern Living (Feb 2019), there was no furniture advertised even though there were several home decorating articles. In fact, there were few “call outs” to the product shown—a true indication of the magazine publisher’s perspective of industry support. If we go past the immediate and ask manufacturers why the immediate response is lack of margin to support consumer advertising. This addresses a decades old question: Can the industry afford not to advertise directly to the consumers the reasons to buy furniture? Are we destined to race to the bottom in terms of price? When we compare the consumer price index of furniture to all other consumer products, we get the answer as illustrated in the graphic. Even with bedding included, the industry is declining even in the good economy we have enjoyed since the 2008/2009 comeback. In fact, we are 12 basis points below where we were in 2008. Should we consider again an industry program to promote furniture as was done in the 80s/90s with Haven Magazine? Where would the industry be if we had cooperated—manufacturers and retailers—in the effort? Only the manufacturer-verticals, such as Ashley and La-Z-Boy, have created a brand presence at the consumer level. Was that the strategy that should have been executed in the manufacturing sector? It is not to say that the industry does not spend to attract/motivate the consumer. In fact, 56% of the gross margin dollars are spent doing so. However, only a portion is spent in pure advertising. The graphic illustrates. The statistics shown in the Expenditures graphic is for traditional furniture stores. Obviously, these percentages vary by volume level and individual retailer strategy. In the last decade, retailers have abandoned a real estate strategy (owned) and leased buildings within established shopping areas with higher occupancy costs. The assumption is that traffic would increase and therefore lower advertising costs. The result is where advertising in total would be 5-6%, now occupancy and advertising combined with the goal being 12-14%. Interestingly, Julius M. Feinblum, president of JMS Real Estate, Inc., a firm that specializes in real estate for the home furnishing industry, cautioned against the use of rigid guidelines, saying each situation is different. The decision to open an additional store should take into consideration the incremental revenue that would absorb existing fixed costs. New distribution channels into furniture retailing take a different perspective. Lifestyle stores, such as Pottery Barn and Restoration Hardware, while selling all home furnishing products, relies on stores in proximity to the consumer and less on advertising. For this distribution channel, reliance is on more stores and targeted direct mail campaigns and catalogs. The table presents some statistics. As can be seen from the table, lifestyle stores have 353 stores per thousand households. This compares to a third of that for FurnitureCore’s Top 100 regional chains/large independents/independents. Another approach is the fast growing e-commerce channels. E-tailers, for the most part, eliminated occupancy and minimal expenditure in presentation (except for online chat), a new financial model was created. However, this model has not been successful to date. Even with competitive pricing, the savings are not enough to offset increased delivery/returns expenses. While still less than 20% of total industry sales, the growth rate is significant. Recently, many of the e-commerce major players are exploring brick and mortar. The major question in furniture retail is what should the message be? The predominance of messaging in traditional retailers is low price – long term financing. Research by FurnitureCore indicates other ways to break through, including product information and humor. A good example of humor is represented in a recent television commercial created for Bernie & Phyl’s in Boston. Bernie & Phyl’s advertising agency, DeVito/Verde, had to address the iconic advertising platform that had served the retailer for decades to increase awareness. As important as the message is, the media used to communicate. According to FurnitureCore research, television for traditional retailers represents the largest share of advertising expenditure. The graphic illustrates the breakdown. From a consumer perspective, the internet/email has the most influence on their intent to purchase as can be seen from the following graphic. 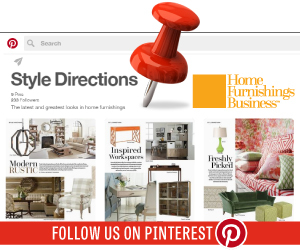 Home Furnishings Business’ custom publishing division has had similar success with their hybrid magalogs (magazine/ catalog format) when combined with consumer targeting. 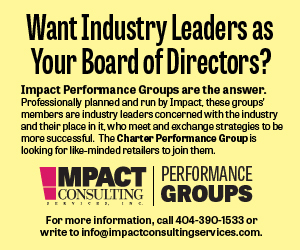 According to Bob George, publisher of Home Furnishings Business, and president of Impact Consulting, the parent company of HFB, a documented purchase of over 9% of a retailer’s customers and 4.5% of profiled customers has been achieved with this high quality content rich piece. We know the consumer is attracted to digital and there are many vendors jumping on the opportunity. The retail experiences can be classified as extended reality (XR), virtual reality (VR), and augmented reality (AR). Augmented reality in the furniture industry has advanced the furthest. While exciting in concept, neither AR/VR will replace advertising in the short term as a motivator to purchase.